An indie action-drama short film is having a Casting Call on November 13, 2014 at 2:00-6:00 pm at Asia Pacific College in Magallanes, Makati City. Some scenes are not suitable for very young audiences. Registration starts at 1:00 pm. All Talents should bring Pictures (3R Close-Up & Whole Body), and a valid ID. They're also looking for Camera Crew, Production Assistant & Apprentice for this project. Role: Single Mom, PUJ Dispatcher 5'5-up, Morena, ACTION/DRAMA/KISSING & BED SCENES. Role: Dirty Cop, Traitor, 5'7-up, Moreno to White Complexion, Smokes Cigar, ACTION/DRAMA/KISSING & BED SCENES. Role: MOB BIG BOSS, 5'7-up, White Complexion, Smokes Cigar & Tobacco Hotheaded, Knowledgeable about drug dealing. Role: BODYGUARD, GOON, 5'7-up, Fair Complexion, Trash-Talks, Smokes Cigar, Simple Maniac. Role: BODYGUARD, GOON, 5'7-up, Fair Complexion, Trash-Talks, Smokes Cigar, Religious. You may contact Gilbert Buen thru +63.917.9759756 for more info. 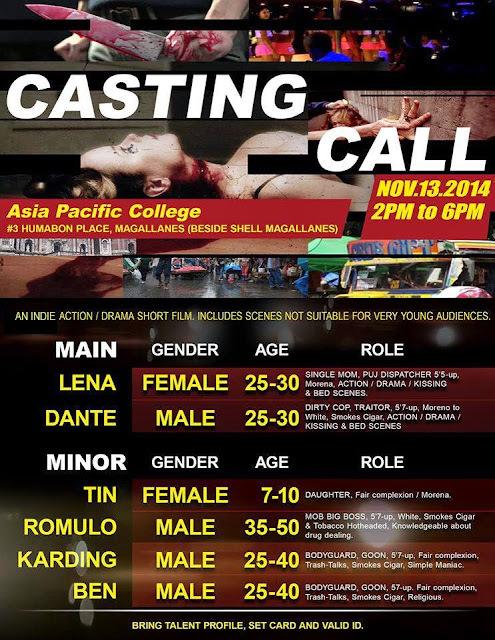 Or text : Fullname, Age, Height, Location, Contact Number, Role to +63.910.8016070.